My brother hates sweet potatoes and I don’t blame him. When we were kids, sweet potatoes were gross. The usual fixings that go along with the holiday feast made us want to gag. We always passed up the sweet potatoes. Then one day about 15 years ago, I found a recipe for baked sweet potato fries. I made them for Thanksgiving and my brother couldn’t stop eating them. Later, I decided to up the ante and do something similar in a home fries version. 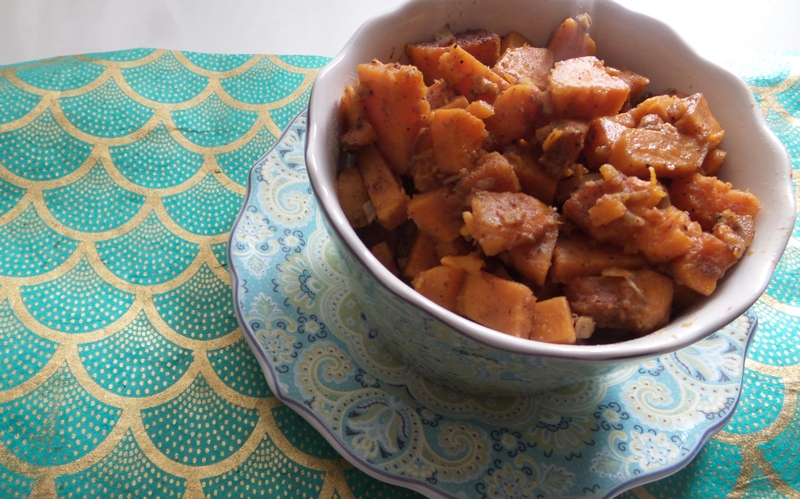 I fell in love with sweet potatoes after I came up with this recipe. When I first moved to NYC, I was invited to a former New York Islanders player’s home for Thanksgiving. His cousin was a friend of mine. I had no idea he was a former hockey player until halfway through the meal when we sat down to watch some hockey. I asked for the New York Rangers game and he almost kicked me out (jokingly). As part of the pot luck, I brought my East Meets West Sweet Potatoes to the dinner. All I heard around me throughout the meal were people going on and on about the sweet potatoes. When Grandpa asked who made the sweet potatoes, I fessed up that it was me. Right then and there, I came up with a name for this dish: East Meets West Sweet Potatoes. 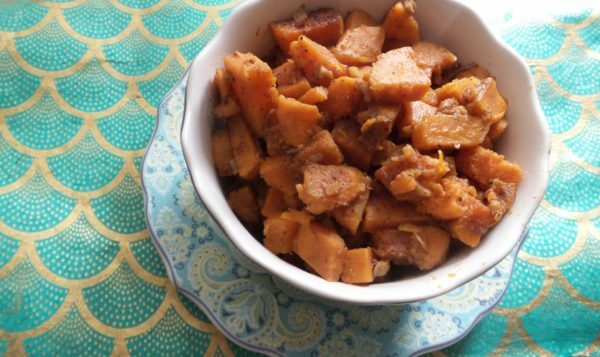 This recipe takes some of the Western ways of making sweet potatoes and mixes a bit of the Asian element into it. What you get is a much more flavorful version that has even the biggest haters of sweet potatoes turning into fans. Hey, my brother loves this dish and he hates sweet potatoes. Add diced ginger and garlic to oil, fry until garlic is browned. Add potatoes, mix with garlic and ginger. Add water and spices, salt and pepper (to taste).